(423) 346-6655. Noted by Mountain bikers to be one of the best trails in the southeast. Private property rides - contact locals - professional. The visitor center at Wartburg, the seat of Morgan County, contains exhibits about the natural history of the area. 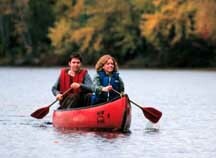 Whitewater canoeists appreciate its fast waters; hikers relish its challenging terrain. Some river bluffs top five hundred feet, and the deep gorges of the area provide for impressive spring and fall scenery. A section of the Cumberland Trail State Park passes through the Obed Wild and Scenic River, including such impressive features as the Devil's Breakfast Table Trail. Three river access points (Nemo, Jett and Lilly). 10. Nemo Bridge Access - (road leading to it is from the square in Wartburg). At pull-in, there is a picnic area, interpretive information board, restroom facilities and parking. 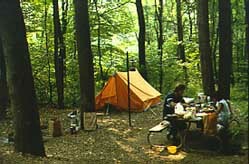 In close proximity is Rock Creek Campground which as 12 sites consisting of tent pad, picnic table, cooking grill and lantern pole. No electricity or water. "On your honor" fee system. 12 Jett Bridge Access - Includes restrooms, picnic area, interpretive information board and parking. 11 Lilly Bridge Access & Overlook (see photos below) - includes restroom facilities, interpretive information board, parking, easy river access (not handicapped accessible). View from the bridge is wonderful. Up the road is the overlook which has ample parking, restroom facilities, interpretive signage area, picnic area, well marked trails, benches, breathtaking overlook and extensive decking out over the bluff. 11,000 acres, visitor center, picnic area, primitive camping and campground, recreational facilities, hiking trails including an 8-mile trek to the top of Frozen Head Mountain. 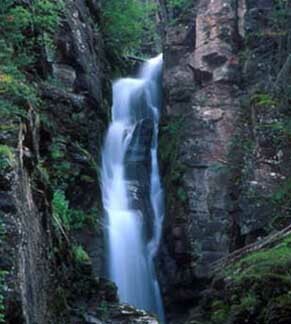 Scenic waterfalls, ranks second only to Great Smoky Mountains in varieties of wildflowers. Trout fishing. (423) 346-3318. Morgan County is home to the Cumberland Trail State Park, Tennessee's first linear State Park. The trail runs through parts of Frozen Head, Bird Mountain, Wartburg and to the historic Nemo Bridge on the Emory River. Many trails open for hikers all along this route. 80,000 acres total - 40,000 are located in Morgan County. Game animals: whitetail deer, wild boar, wild turkey, bobcat, rabbit, quail, grouse, squirrel. Camping and hunting are allowed. Considered the "Crown Jewell" of WMA's because of its size, beauty and outdoor activities. (800) 262-6704. 6. Big South Fork National River & Recreation Area. The river passes through scenic gorges and valleys containing a wide range of natural and historic features. 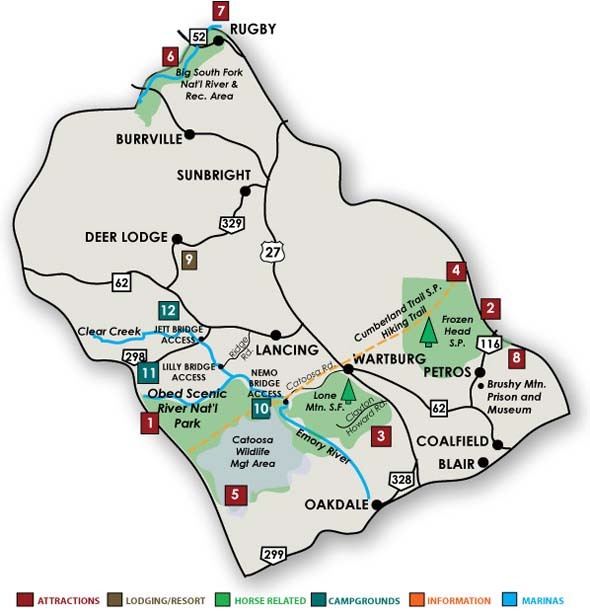 Recreation: camping, whitewater rafting, kayaking, canoeing, hiking, horseback riding, mountain biking, hunting and fishing. Located near Petros, a maximum security facility. The Tennessee Department of Correction offers tours of the facilities to school groups, local law enforcement, community organizations and historical buffs. The museum is located in the front of the century old prison. It was est. in 1996. Although small in size, it offers curiosity seekers an opportunity to view old record books, photos and articles written about the prison including details of the brief escape of James Earl Ray. Brushy Mountain Prison was built with stones mined on the property and has an underground creek flowing beneath the prison. Weidemann Hotel - Historical Society known for its Annual 4th of July Event. County Seat and Staging area for the County. A few homes, churches, post office and some abandoned buildings are nearly all that remain of a once bustling railroad town. Oakdale has its roots in the railroad. In the 1880s, Cincinnati Ohio build a railroad route through the mountainous terrain and started a hotel for its railroad workers. The hotel was named Babahatchie which was the river's name and meant "babbling waters." The town prospered for years after the turn of the century. This historic community was founded in 1880 by British author, statesman and social reformer Thomas Hughes. 60,000-70,000 travelers visit HISTORIC RUGBY each year to get a taste of Victorian English and APPALACHIAN heritage. Around 20 original buildings remain IN A BEAUTIFUL WOODED RIVER GORGE SETTING. FOUR ARE open to the public DAILY YEAR ROUND ON TOUR. Experience the Harrow Road Cafe's unique dining menu in an English atmosphere, spend the night at Grey Gables Bed & Breakfast Inn OR HISTORIC RUGBY'S 1880 NEWBURY HOUSE B & B; SHOP at R.M. Brooks General Store, THE RUGBY COMMISSARY AND SPIRIT OF REDHILL ART SHOP; WANDER RIVERSIDE TRAILS BUILT BY THE 1880S COLONISTS; ATTEND YEAR-ROUND EVENTS, THEATRE PERFORMANCES AND CRAFT WORKSHOPS.